Brett K. Duncan & Co. is a general practice law firm that prides itself on finding innovative solutions to all of our clients’ needs. Located near the intersection of Interstates 55 and 12, we are uniquely situated to provide representation in all state and federal courts and administrative agencies throughout the State of Louisiana. Our approach to representation concentrates on both advocacy and consultation. As an advocate, an attorney must posses the skill necessary to prevail in the courtroom. In this role, Brett K. Duncan & Co is prepared to aggressively prosecute or defend any claim that our clients may have. However, many attorneys often rush into litigation when more creative solutions would better serve their client’s needs. Needless litigation can waste a client’s time and money. In our role as counselors, we are committed to helping our clients develop strategies to avoid litigation before it starts. When disputes do arise, we work with our clients to find the most efficient means of resolving the claim. Regardless of the approach, integrity is the cornerstone of our practice. Brett K. Duncan & Co is committed to representing our clients in a manner that reflects well on both attorney and clients. 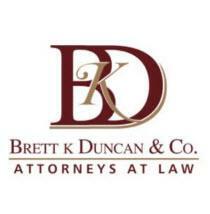 Click here for a free online consultation with Brett K. Duncan & Co.